As an orphan, Célestine's fate has been chosen: her job, along with the other orphans, is to sneak into the town and steal the teeth that bear cubs leave under their pillows, so that mouse dentists can re-purpose them for rodential use. This is a parody of the legend of La petite souris (The little mouse), the French equivalent of The Tooth Fairy. 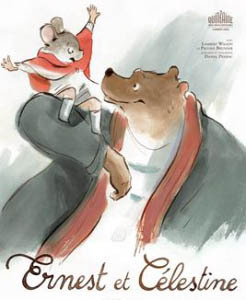 Célestine doesn't understand why bears have to be the enemies of mice, and after an unsuccessful mission she ends up trapped in a garbage can, where a starving Ernest discovers her. To bears, mice are a pest, and he's desperate enough to try eating her; only her active personality and quick wit convinces him to instead rob the local candy shop, and eventually he helps bring a huge bag of teeth back to her home. Of course, bears aren't supposed to befriend mice or vice-versa, so their activities create quite a calamity, made worse by the amount of collateral damage Ernest leaves in his wake. Inwardly he's a nice guy, but he's not a fast thinker, is short on patience, and tends to resort to brute-force methods to solve his immediate problems. Once on the run, they essentially become public enemy number one. That may seem rather extreme and silly, but remember this is a kid's film - the adults are depicted as part of a grumpy, inflexible, rule-obsessed Establishment, and woe to anyone who doesn't fit into societal expectations. 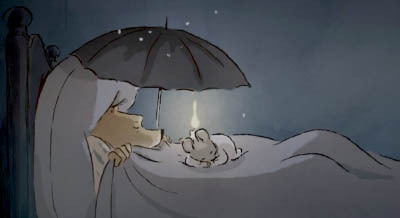 Still, both Ernest and Celestine have been treated pretty shabbily and are qutie content to buck the system, and their friendship grows as winter passes into spring. Things get darker after the law catches up with them, but no worries; there's a happy ending. I really liked this film. It doesn't rush itself, it takes opportunities for slower, introspective moments as well as fast-paced, action-filled ones. It's absolutely littered with funny little moments, yet also gets dark and serious when it needs to be, which isn't too often. I also thought the visual design was really interesting. 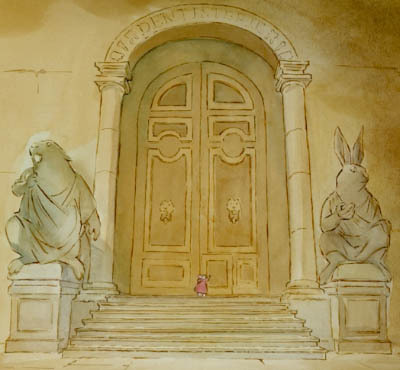 In most 2D animated films, you have very artistic backgrounds with more simply-drawn characters imposed upon them. In this movie, both the foreground and the background blend perfectly - and they managed to do it while making everything look like it was done in watercolors. Great job! In France, Ernest et Célestine did very well at the box office, especially considering it was up against The Hobbit: An Unexpected Journey. Directed by Benjamin Renner, Stéphane Aubier and Vincent Patar (two of whom also directed A Town called Panic, which I reviewed earlier), this film was written by Daniel Pennac, based on a series of children's books by Gabrielle Vincent, which I have not read. The run-time is about 78 minutes. 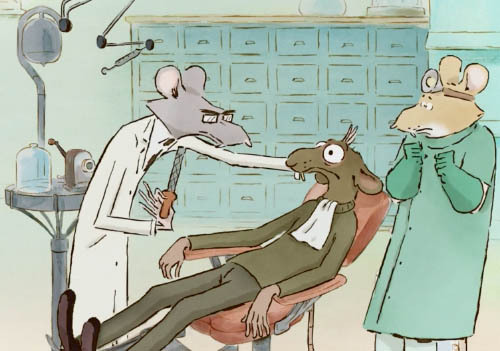 So yep, overall it's definitely worth a watch if you don't mind it being aimed at a younger audience (and as long as you aren't terrified of dentists). It's entertaining, full of simple fun, delightfully written and animated. Here's hoping a good English version comes our way soon! 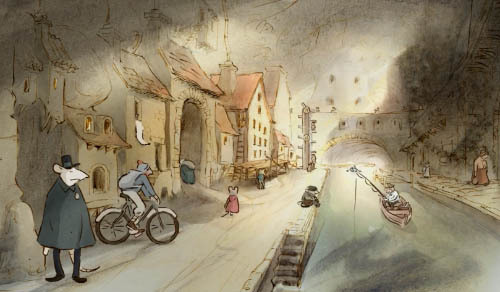 Gkids apparently has North American distribution rights, at least on the film festival circuit; hopefully a DVD will follow. And in the UK, as of May 27 there should be a French DVD available with English subtitles. Update: There are now English subtitles. The start time may need adjustment, depending if someone clipped the opening credits off the video file or not. Update! : Gkids will be showing the film in New York and in Los Angeles on March 14, 2014, to be followed by more theaters across the U.S.
My sister Sherry and I went to a GKids publicity screening of "Ernest & Célestine" in North Hollywood on November 18. 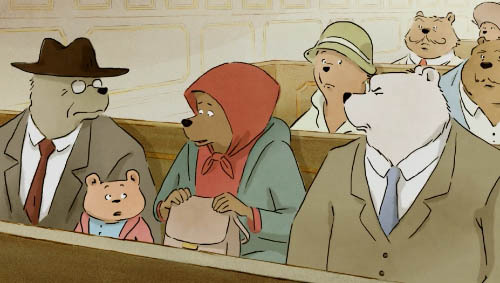 It was in French with English subtitles; GKids is still completing its dubbing of the whole movie for its American release. I loved it; Sherry didn't. I think that most Flayrah readers will like it very much. The ending is a bit simplistic, but it is based on a book for little children, although the movie is successfully for all ages.